Today my first born baby girl celebrates her 24th birthday. Happy Birthday Daughter1! 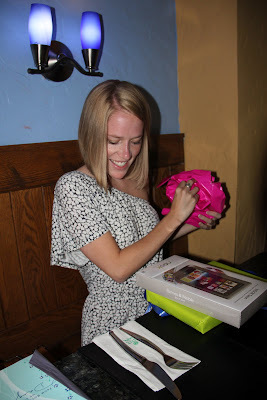 I've written several birthday posts for her since I started blogging which you'll find here, here and here. Gosh I'm wordy. Goodnight Moon...Brown Bear Brown Bear...The Tale of Two Bad Mice...Are You My Mother? Since her birthday falls midweek this year and she has an honest to goodness grown up job, we won't get to see her on her big day. Boo. When your kids were young did it ever occur to you that you wouldn't always be with them on their birthdays? Me neither. In spite of her great love for the latest technology and her lifelong love affair with books, Daughter1 has been slow to come round to the electronic reader. I get it, really I do, but I also know how much she'll enjoy it once she takes the plunge. She travels a lot (have you read her blog???) and she also commutes back and forth to work by train everyday. An e-reader makes sense and I've assured her there is room in our lives for both. Plus we're gonna be NOOK buddies now. Just as soon as she tells me how. Ha. I knew before I had children that I would read to them. I knew we would go to the library often and we'd have piles of books in every room of our house. Love for reading was a gift my mother gave me and I knew from an early age it was precious. 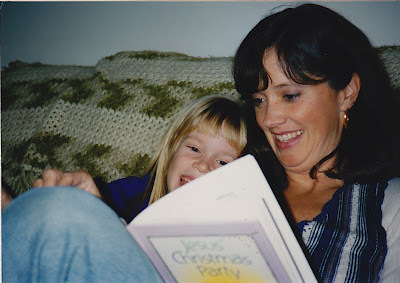 Some of my happiest childhood memories are the hours I spent curled up on the couch beside my mom while she read aloud. I wanted that kind of memory for my own daughters too. My mom continued reading to my sister and I long past the age where we could read for ourselves. I did the same when I became a mom. My girls and I stepped into the pages of these stories hand in hand and they connect us still. knew that somehow reading together was an important ingredient in making that happen. My girls are grown now but we still share a love of books and words and each other. Their imaginations have always been as big as the sky. I like to think the books of their childhood and the time we spent there together have something to do with that. 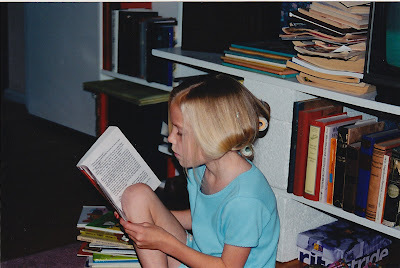 I've sprinkled some of Daughter1's favorite titles into her birthday post today, 24 to be exact. One for each candle on her cake. These titles leap out at me when I wander the aisles of a bookstore. Just a glimpse and I am whisked right back to a comfy couch and the feel of a little girls head on my shoulder as she snuggled in close. If you have time today, hop over to Daughter1's blog (Sincerely-Shannon) and wish her a happy birthday. While you're there, share the title of your favorite book...after all, she's got a NOOK to load. I love you Daughter1! Awww, how sweet!! Happy Birthday, D1! A lovely tribute to a wonderful daughter. She will love her e-reader - they are so convenient. I tried to be intentional about reading too,they are some of my very favorite mama moments. Very sweet, Happy Birthday Daughter 1! oh Happy Birthday to your daughter! I will hop over and wish her a happy one. 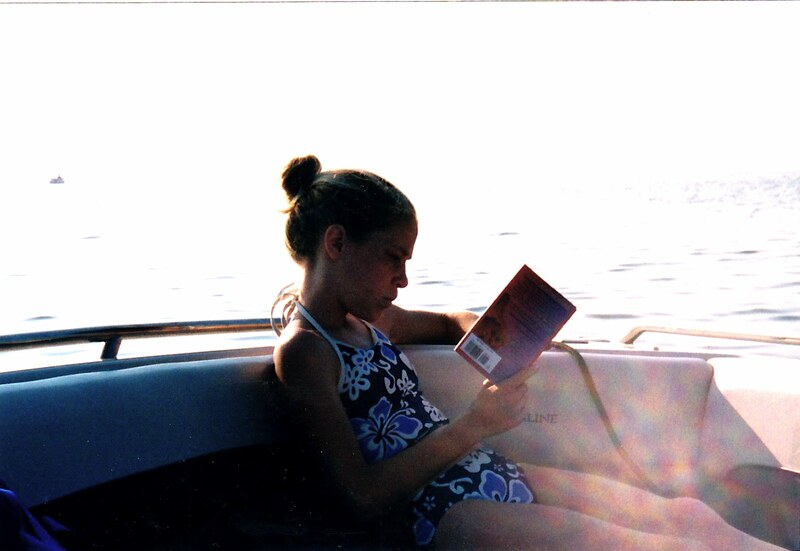 I love the picture of her reading in the water. That would be me. Love you with the darker hair!! We have children who share the same birthday, but mine is 25 today. Happy Birthday to your daughter! I love your book themed post. My love of reading didn't really pass to the birthday boy (despite my best effort)... he would rather study the golf course! Interesting to think about nature vs. nurture when it comes to reading. One of the greatest gifts we mamas can give our children is the love of reading. I'm so thankful that my mom gave me that gift and that I gave it to my daughter, who's giving it to her little ones. I love the flow of this post. Daughter 1 and her books and all the pictures. My cousin was like this and still if. Always a book or a reader in her hand! What a sweet post today about your daughter. They grow up so fast!Before you know it, they are reading to their own kids. Aww, happy birthday to your sweet daughter. And, yes, I read many of the same books with my daughters. Happy birthday to your daughter! How wonderful that you've passed along your love of reading. Best gift ever! Thank you so much for such a sweet post and thank you so much for reading to me and giving me that awesome love for books! I still love all those listed and can't wait to read them to my own children some day! I'm excited to get some good recommendations for my new nook! I'm going to have to head over and visit her blog...thanks for the link. Happy Birthday to your sweet D1! I'm sure she will embrace the reader they are a techi generation and the commute will agree with it. 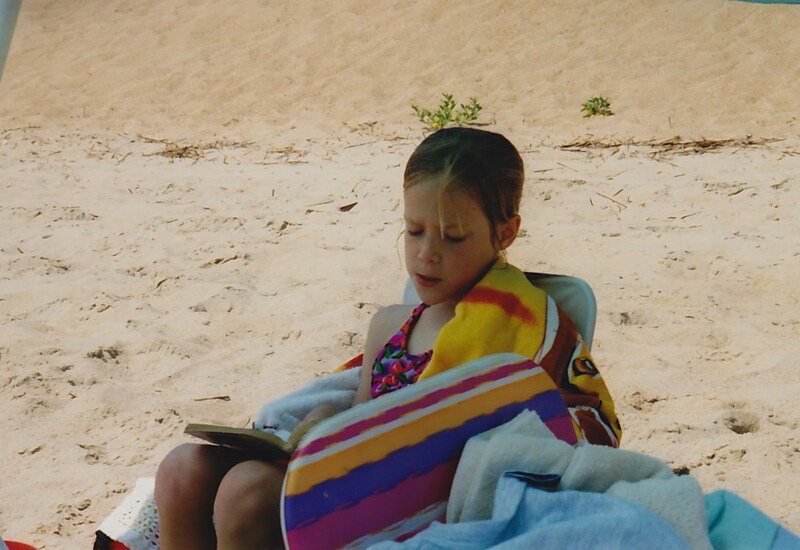 I wish my daughter loved reading as much as I do...but when I was her age i didn't love it either...some day! We have three who read like that. You won't ever see them without a book- and Birdie usually has 3 going at the same time. She just keeps them in different rooms. And then there's the one in her car. LOL She's the one who will be 24 in October. A very happy birthday to your lovely! I hope her day is fabulous! I'm going over to her blog and leave wishes there too! This is so sweet. 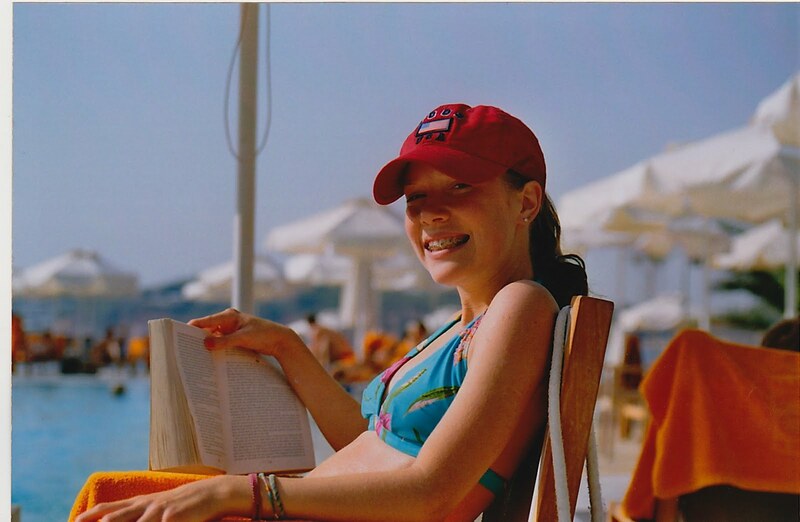 I love all the book titles... And that picture of her standing in the ocean reading is priceless! A lovely post :) I was just making a list for summer reading with my girl...I might steal a few titles from you! And I just finished Unbroken by Laura Hillenbrand. Misty-eyed here! So sweet! 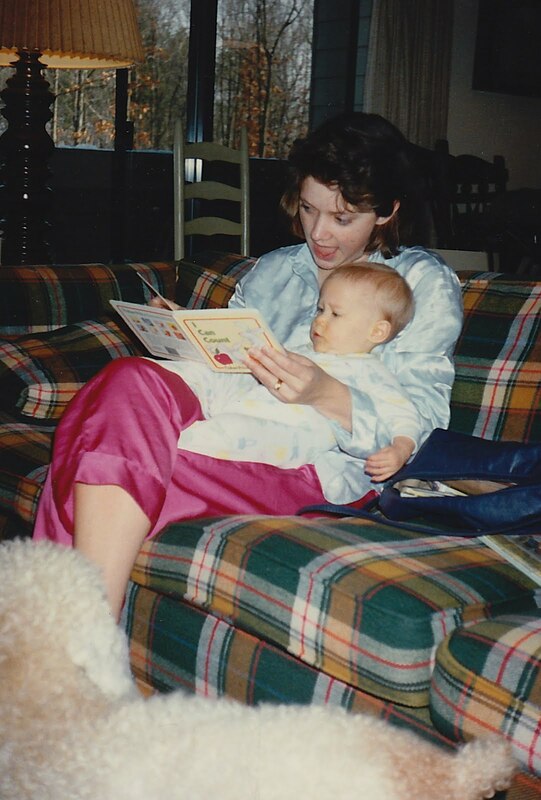 My mother, too, read to my brother and I long after we could read for ourselves. I carried on the tradition for the same reasons you so eloquently mentioned. I forgot about Bread and Jam for Francis. Where could that book be, I wonder? It will get read here in the near future. Off to visit Shannon and wish her a happy b-day! Happy 24th Birthday daughter1. I guess it's about every six years or so that we actually get to be together on their day. Looks like you had a fun celebration breakfast. Love all the photos. As a fellow mom who read to her children and as a reading teacher, your post made me smile. Happy Birthday to your girl and kudos to you for a job well done! Wishing your beautiful girl a very Happy Birthday! You have such a gift for the written word, Joyce! What a lovely post for a lovely girl. I so enjoy reading her blog and it's just confirmation that the "apple doesn't fall far from the tree." My little 3 1/2 year old Grandson knows Brown Bear Brown Bear by memory. It is so cute when he recites it. He recites while he's turning the pages, acting like he's reading it. What a fun birthday post. I love many of those choices too. Happy bday to your sweet girl! A mom who reads to her children gives those kids a wonderful heritage. Beautiful post. What a great birthday tribute. The love of reading...never underestimate it's power. And the 24 book titles? Priceless! What a beautiful post as I wipe tears. Time does fly! My baby will be 30 this year. I read to her all the time also and she does read to Eden Jade, but as far as her reading herself she does not like to...and I have to admit it saddens this momma! Maybe one day!